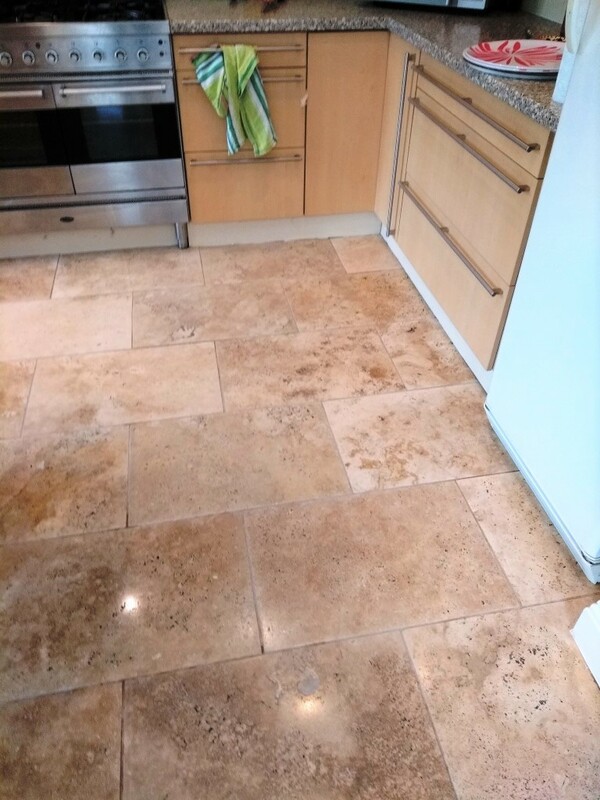 These photos are of a Travertine Tiled Floor installed in the Kitchen and Dining area of a property in Cheltenham also known as Cheltenham Spa. The property is situated in a lovely location with Cheltenham being located on the edge of the Cotswolds, which is well known as an ‘Area of Outstanding Natural Beauty’ in Gloucestershire. The floor which was installed 15 years prior had sadly not been maintained correctly over the years and was not looking its best, any sealer that may have been present on the floor had long since worn off with wear and now dirt had penetrated the pores of the Travertine making it difficult to keep clean and giving it a flat uninteresting appearance. 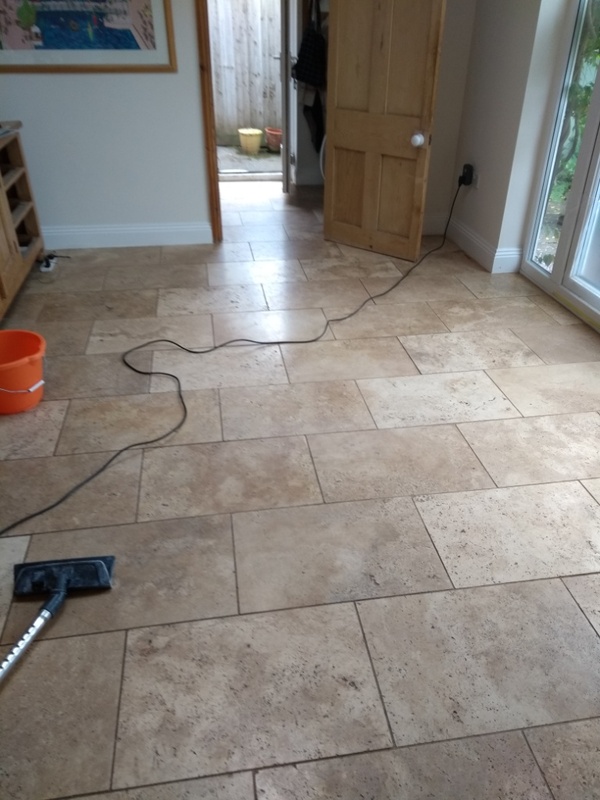 The customer was specifically unhappy with what appeared dull looking marks all over the floor and the grout lines which were heavily ingrained with dirt and had now become black. Travertine is a natural stone material that has unique colours and features that no other stone can offer. The distinctive designs and natural patterns found within Travertine make it very popular as a flooring material and if treated properly it can look beautiful. I discussed with the client what Tile Doctor could do to improve the appearance of the floor, we agreed the cost and organised a date to get started. Before starting I protected the wooden skirting and kitchen units with plastic sheeting to ensure they did not get damaged. The floor was then burnished using a set of diamond encrusted burnishing pads of different grits using our usual process of lubricating with water and rinsing between each pad. Working my way through the different pads I started with the coarse 400-grit pad, then the 800-grit and finished on the 1500-grit. The grout lines were then cleaned with Tile Doctor Remove and Go this is a multi-purpose stripper formulated with a long dwell-time that can clean whilst removing most sealers, coatings, synthetic finishes, adhesives and paints; pretty much most things that could have be left on the floor over 15 years! I then rinsed of the now soiled cleaning solution off the floor with water which was then extracted using the wet vacuum. I then left the floor to dry off fully overnight. On my return the next day I applied the last of the burnishing pads which is an extra fine 3000-grit pad really bring up the polish on the stone. This pad is applied dry with a little water sprayed onto the stone using a method we call a Spray Burnish. 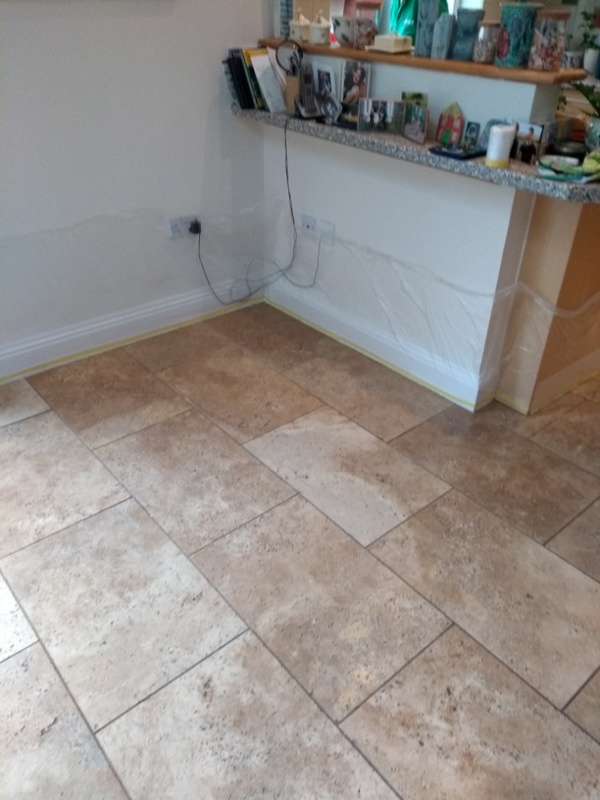 The floor was then sealed with two coats of Tile Doctor Colour Grow, this product is a colour intensifying sealer which enhances the natural colours in the Travertine whilst adding durable stain protection. I highly recommend colour grow for sealing Travertine as it really does bring out the natural brown shades in the stone. The floor was left to dry and then buffed with a soft white buffing pad to bring the shine further. 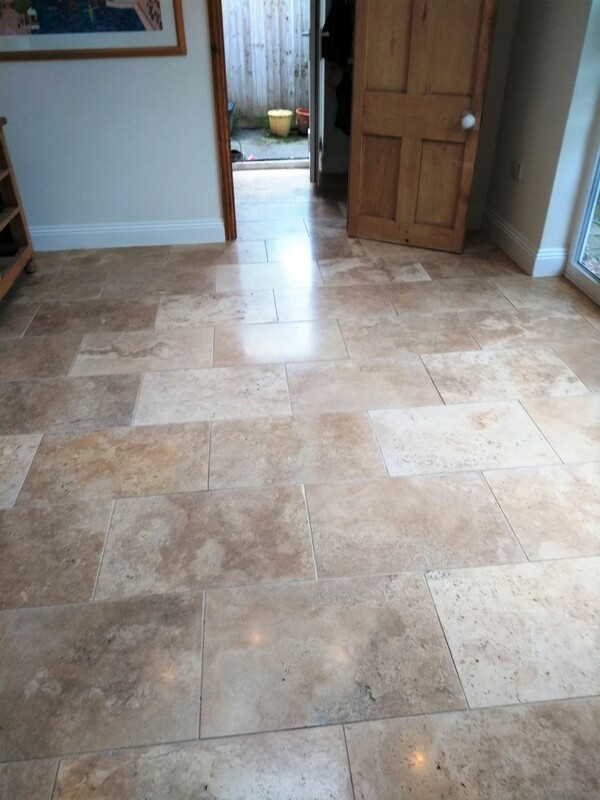 “Our travertine floor has been transformed from a dull, impossible to clean surface to one that looks better than it did fifteen years ago. Every time I walk into the kitchen I stop just to look at it. I am delighted with what you have achieved! Thank you. This entry was posted in Cheltenham, Cotswolds, Gloucestershire, Grout Cleaning. Stone Polishing, kitchen floor cleaning, Polished, polishing, Sealing Travertine, Tile Cleaning Activities, Travertine Restoration, Travertine Tile, Work History by TileProf. Bookmark the permalink.